Location: Flint Institute of Arts, 1120 East Kearsley Street, Flint, Michigan 48503. Map. Check your Shuttle Schedule, or logistics on your Whova app, for departure details. Join us for a full breakfast at SEJ’s leisurely and literary Sunday morning sessions. 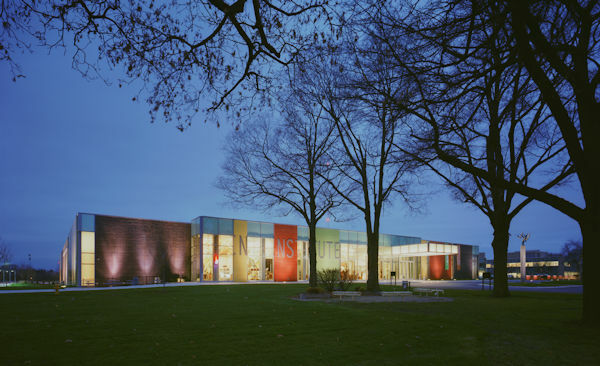 Founded in 1928, the Flint Institute of Arts takes us back to the city’s prosperous beginnings and houses more than 8,000 works of art. Attendees can tour this impressive collection bookended by a panel of noted authors and the ever-popular book slam, where you can try your hand at pitching the next great book idea to a panel of editors and agents. Pre-registration and $25 fee required. Sponsored in part by the Knight-Wallace Fellows at the University of Michigan. The book market is one segment of journalism that is still flourishing. Over breakfast, recently published authors share stories and advice for birthing a successful book — from the glimmer-in-the-eye stage through conception and postpartum promotion. Driven in part by audience questions, the conversation will cover shaping an idea and constructing a winning proposal; working with agents and editors; carving out time and space to write; fighting procrastination; marketing and promoting; and spinning off to film, periodicals and other media. Coverage. Moderator: Tom Clynes, Author, "The Boy Who Played with Fusion"
Lisa Gardiner, Author, "Tales from an Uncertain World: What Other Assorted Disasters Can Teach Us About Climate Change"
Rachel Nuwer, Freelance Journalist and Author, "Poached: Inside the Dark World of Wildlife Trafficking"
Between the two sessions attendees are welcome to browse the Hodge and Henry temporary galleries currently featuring "Collecting Stories," which provides a deep look into 90 years of art donations to the FIA. In addition, guests may view the permanent galleries, which include more than 8,000 works of art, as well as the new expansion of the Contemporary Craft Wing, which highlights works by more than 85 glass artists from the Glass Glass Collection and ceramics from the Harris-Burger Collection. Have a book idea bubbling up that's ready to be aired in front of a panel of keen-eyed book editors? Representatives of large, small and academic presses will provide constructive criticism from their different vantages of your pitch, while also giving insights into what publishing houses are seeking from book authors and the stories they tell. This is an annual SEJ conference favorite and fills up quickly, so advance sign-up is required. Email the moderator, meerasub@gmail.com, with a working title to secure your spot. Spending the time to craft your pitch in advance is strongly recommended; two minutes is about 200 words and the time limit is strict so everyone has a chance. Those not pitching are welcome to attend with the caveat that this is a confidential session. It will not be recorded. Moderator: Meera Subramanian, Journalist and Author, "A River Runs Again: India's Natural World in Crisis, from the Barren Cliffs of Rajasthan to the Farmlands of Karnataka"
Noon: Conference ends and shuttles take attendees back to hotels or to the Flint airport, with airport arrival no later than 1:00 p.m. The Great Lakes from space. Click to enlarge. 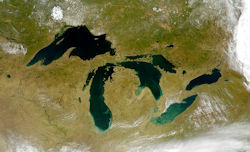 The Great Lakes comprise nearly 20 percent of the world’s fresh surface water and touch everything from pristine Canadian forests to urban centers like Chicago, Detroit and Cleveland. The lakes also carry timber, grain, copper and iron to the world. We’ll take participants into Michigan’s eastern Upper Peninsula and the convergence of the three largest lakes — Superior, Huron and Michigan — to look at a wide range of issues that impact both the Great Lakes and North America. Potential topics include Enbridge’s Line 5, wind power, aquatic invasive species, climate impacts on northern forests, logging, shipping, mining infrastructure and legacy pollution. Tour departs at 10:00 a.m. on Sunday and returns to Flint no later than 4:00 p.m. on Wednesday, October 10. Tour-goers will be picked up by IJNR either at the Flint Institute of Arts, for those attending the morning program, or at their hotel. There will be no cost to journalists accepted to participate in the tour. For more information or to apply, please visit www.ijnr.org. Application deadline: September 21. Sponsored in part by the C.S. Mott Foundation.